The early 17th century was a time of change but also of continuity. The modern concertante style, which found its expression, among others, in monodic pieces for solo voices, coexisted with the traditional polyphony of previous centuries. One of the most impressive examples of this is the Vespro della Beata Vergine by Claudio Monteverdi. The concerti are the most pure specimens of the monodic style, whereas the psalm settings and the Magnificat are a mixture of the stile antico and the stile nuovo. That same collection also includes the Missa In illo tempore. Its title indicates that Monteverdi here links up with a long tradition of using pre-existing material as the starting point of a mass, generally known as parody mass. In this case, he turned to a motet by one of the main representatives of the Franco-Flemish school, Nicolas Gombert. According to New Grove, a parody mass "is unified by the presence of the entire texture of a pre-existing polyphonic work, represented by borrowed motifs and points of imitation." Monteverdi follows a somewhat different path. He selected ten motifs from Gombert’s motet, which he called fughe and included in the edition. They are printed in the booklet to the present disc; this helps the listener to recognize them. They are used in different ways: sometimes in their original form, sometimes in inversion or with added ornaments. Monteverdi uses them in apparently random order. 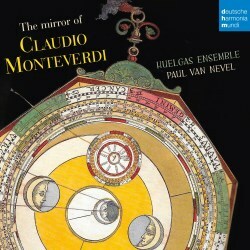 In his liner-notes, Paul Van Nevel refers to Monteverdi's procedure as a specimen of a “neo-Renaissance” style. The various sections of the mass are alternated by four madrigals by composers of a previous generation. They do bear the traces of the expression which became a common feature of vocal music of Monteverdi and his time. In the pieces by Nicolo Vicentino and Cesare Tudino, we find an extensive use of chromaticism. They are very reminiscent of the madrigals of Carlo Gesualdo, especially those in his last books. In the madrigals recorded here there is not always a clear connection between chromaticism and the text. One has the impression that the use of this device was part of some experimentation in regard to harmony. Nicola Vicentino, who called himself a pupil of Adrian Willaert, was known for this. In 1551 he was involved in a debate in Rome with the Portuguese musician Vicente Lusitano about his theories on harmony, which he later explained in a treatise. Cesare Tudino was from Atri, where he seems to have worked all his life. Two of his madrigals were marked madrigali cromatici; I assume that Amor, t'ho molti e molt'anni pianto is one of them. There is a much stronger connection between text and music in the madrigals by Giaches de Wert and Luca Marenzio. Both can be considered important forerunners of the stile nuovo. In De Wert we find declamatory passages which would become one of the features of the monodic style. Text expression is an important aspect of the madrigals of Luca Marenzio, one of the composers who influenced Monteverdi. Solo e pensoso is one of his most famous pieces. Paul Van Nevel is a master in exploring the peculiarities of such madrigals, thanks to his group of outstanding singers whose voices blend beautifully and who pay utmost attention to the text. Because of their perfect intonation, the harmonic intricacies come off to full effect. The connection between text and music is fully exposed. Monteverdi's mass often receives a rather straightforward performance, like a mass by Palestrina. Van Nevel's interpretation is different: he shapes the lines beautifully, with subtle dynamic shading and more attention to the text than is common in renaissance polyphony. This is probably the best performance of the Missa In illo tempore that I have heard. This disc is an interesting demonstration of the way Monteverdi was inspired by tradition and regenerated it.